We weren’t planning to head home via the coast but the weather reports and local knowledge (aka a farmer from Gore, a Johnston of course) advised us against tackling the inland passes. The ute of course could do it easily on its own, snow chains and all, but towing a heavy caravan was another thing altogether. So the coast road it was. Invercargill – upper Catlins – Balclutha – Dunedin. Snowy mountains loomed around, showing us how wise that decision had been. The weather changed all the time – sunny one moment, raining the next. Where to stop for the night? We were not in a hurry, our homesitters having advised us that everyone was happy. We’ve been to Moeraki many times, photographed the boulders, even had dinner at the famous Fleur’s. But it’s always different. So we decided to spend the night at the Moeraki caravan park on the hill overlooking the port, where we’ve been before, and have a look at the boulders in the early morning light. En route there was an awesome cloudscape. I was a little too late to get some good sunset photos, distracted not only by the cold wind but by the hundreds of rabbits scampering around in the dusk. What would have happened if Penny the foxie had been with us? Next morning it was cold and blowing strongly. High tide was at about 8 am so we decided we would make a leisurely exit from the caravan park and have morning coffee at the Moeraki Boulders cafe. Here’s the view as we were leaving the park next morning. After a first quick look from the cafe deck …. …. and an invigorating coffee and ginger slice near the roaring fire, while admiring the views …. …. it was down the private pathway to the beach. The pathway costs $2 per person but I think it is justified, it must be costly to maintain and it provided such a convenient route – and boot scrubbers on our return. The beach is very dark clingy mud/sand at the high tide mark and there was only a narrow space between it and the surging tide. I was pleased with my new Lumix camera, it took wonderful photos even shooting straight into the sun. The boulders were still there (!!!!!!) Well of course they were. New ones are being calved off regularly. Here’s one at beach level and another a bit higher off the cliff. Dave climbed up to take his photos but I preferred to stay at beach level. You can see we were well rugged up! Anyone who has been there knows it is impossible to stop taking photos. Finally tearing ourselves away we set off again, heading for Geraldine. Our GPSr took us down some back roads with mountains in the distance. A pity there were so many poles and overhead wires to spoil the photos. There is a wonderful cafe at a winery somewhere south of Geraldine, we couldn’t remember exactly where and also wondered if it would be open at this time of year. So we decided to stop at Peski’s for the night and make enquiries at the Information Centre in town. Peski’s is a well-known private property providing parking for caravans and motorhomes. The new owners made us welcome, helped by little Tui the “ferocious” little poodle cross who belonged to the previous owners and has stayed on to help welcome people, as she’s been doing for years. It is very difficult to get a photo of her keeping still! A quick trip to town confirmed that the winery was closed so we consoled ourselves with a visit to the Barkers shop, coming away laden with jams, chutneys and a huge bottle of salted caramel sauce. Next day, an easy trip home with lunch at “Nosh” in the Ashburton Mills village – highly recommended. I couldn’t resist the lure of the wool shop next door; Dave occasionally deserves a medal for patience and he earned one that time. This was the first time the AGM has been held in the deep south. The local committee did a wonderful job; preparations started long ago even before we attended the Clan Gathering there last year. Quite a few people came from the North Island but naturally there were several family groups from Invercargill and surrounds. The Ascot Park Hotel was the venue, diagonally across the road from where we were parked. But our initial intention to stroll over was thwarted by the weather. Just inside the lobby was a magnificent Arrol-Johnston motorcar circa 1927 (note numberplate), owned by an Invercargill resident. It set the tone for the whole proceedings. Dave can be seen at the back right with a red cap. When I googled Arrol-Johnston I discovered that Shackleton was given a car specially built for his Nimrod Antarctic expedition of 1907-1908. “These were the pioneer days of the motor car, it wasn’t terribly successful” . There’s a whole website about it at https://www.coolantarctica.com/Antarctica%20fact%20file/History/first-car-in-antarctica-shackleton.php which makes fascinating reading. Sadly what happened to the car is unknown. We had a whole large room to ourselves. Tables along the walls were covered with local Johnston/e family histories and memorabilia. A rather magnificent family tree stretched almost across the room. Judging from the number of local family trees, almost the entire early population must have consisted of Johnston/es! The AGM passed without incident. As is happening elsewhere in NZ and also Australia, it is becoming difficult to attract more younger members, but hopefully the Clan will survive. Afterwards, members were invited to give a short talk about their families. With a little persuasion Dave was enticed to the rostrum and talked about his GGGrand Father James Johnstone who built the immigration barracks in Christchurch. Soon after his talk he was approached by one of the other members who said his GGrand Mother was born in the barracks. In NZ there never seems to be more than a few degrees of separation between people!! After the AGM, lunch was announced. The back wall of the room suddenly folded back to reveal a long buffet table with hot and cold food, the roasts presided over by a chef and assistants. Simple but very good food. There were various activities planned for the afternoon. Dave and I had opted to go digging – yes, really! – at a place called “Dig This” – NZ’s first heavy equipment playground. https://www.transportworld.co.nz/dig-this/ It’s always been my ambition to operate a bulldozer/excavator but unfortunately the weather once again put a stopper to this idea. Instead Dave went off to a hitherto undiscovered motorbike museum and I retired to our cosy caravan to read and knit. Others went to the main Museum, Art Gallery etc all of which I have visited more than once before. That evening was the Clan dinner, with entertainment. We got all dressed up in our Scottish finery. It started with the ceremonial Address to the Haggis. Dave was wearing his Bruce kilt, not Johnston, but was still invited to carry the precious whisky and crystal glasses on a silver tray. What an honour. Knowing that the contents had to be knocked off in one gulp, he was careful pouring – then told to add more, not once but twice. He said afterwards it seemed a shame to waste such glorious stuff instead of sipping it quietly! (Photos by a Clan member). After dinner there was an interesting address given by a local man, a blueberry grower, who was once many other things and whose interests include blacksmithing. He had a special claymore (Scottish two-handed fighting sword) made specially for him according to his height, and afterwards was surrounded by curious Johnston clansmen all eager to give it a heft or two. He talked about iron and steel and tempering the latter …. it was a very interesting talk. I know it was interesting because the dear man gave me his notes afterwards. A Mystery Tour and Lunch was planned for the next day. It still went ahead, although not much could be seen through the rain. We headed for Riverton via back roads, with some interesting comment along the way. Lunch was at a cafe overlooking Riverton and was wonderful. I wonder what the cafe people though when they realised they had a table for 26 almost all with the surname Johnston!! We are on the road again, heading for Invercargill for the Clan Johnston/e AGM and general festivities. It’s been a while …. First we had to find someone to look after Penny, a diabetic Oscar and Georgie. Kiwihomesitters came to the rescue, the first people to contact us turned out to be ideal. We met them for the first time a week ago and they immediately connected with the pets and vice versa. Phil was not fazed at the thought of giving Oscar his insulin injections. Thus reassured, plans for our departure forged ahead. On the morning of our departure the last thing to be loaded into the caravan was of course the perishables,, and that’s where things came slightly unhinged. We drove off happily, thinking we had everything when in fact we had forgotten to load the bread and cheese (but we DID have wine! ), a big bowl of fruit and the whisky and Canterbury Cream! All were ready and waiting. We also drove off with the caravan door open and our wonderful home sitter who waved us off immediately sent a text to warn us. South went in the light rain until someway north of Oamaru when we turned off on the road to Kurow but stopped half way at a NZMCA camp at Aviemore. There was only one other caravan there. A herd of very curious cows welcomed us from the other side of a fence; but the time we had set up the caravan and I had grabbed my camera, more than half of them had wandered over to the fence to goggle at the strange vehicle – or was it people? After setting up we disconnected the ute and drove to Oamaru for the missing perishables plus an extra hot water bottle. Which turned out to be very useful. Next morning we made a late start and stopped off at Moeraki for coffee at the cafe overlooking the boulder-strewn beach. We did not have time to go right down to the boulders, a pity as it was low tide. Next time perhaps. Past Dunedin (with a quick shot of the fabulous railway building plus the one opposite, both from the moving ute) we were getting hungry so stopped at a convenient rest stop, the first to appear for a very long time. We were munching away when a woman popped her head in the doorway and asked if we would mind talking about the caravan. It turned out she and her husband are thinking of buying one, and were seeking general information which Dave was happy to give. The countryside in South East Otago, just north of the Catlins, is so very different from Central Otago. Beautiful green rolling countryside. The weather was very changeable but I tried to take a few photos as we rolled along – nowhere to stop with a caravan to take photos. The old bridge over the Clutha at Balclutha still the same, also the horses at Clinton, which barely got a glance. We arrived in Invercargill just before dusk and checked in at the Coachman Motel which offers good powered sites for caravans, also hot showers. Tomorrow the Clan Johnston/e events start. Both Dave and I are Johnstons but not related, at least as far back as I can trace to the 1700s. Dave is a member of the NZ Founders Society, which represents descendants of the early NZ settlers who arrived before the end of 1865. Established in March 1939 to honour the work and achievements of NZ pioneer ancestors “… whose contribution helped shape our nation and its history”, it now has various branches including Canterbury. The House was badly damaged in the February 2011 earthquake and $2.5 million was spent on the full restoration over 3.5 years. Past Manager Rob Daly was in his office at the time of the earthquake and is quoted as saying at no time did he fear for his safety as he had “faith in the robustness of the Old Lady”. Our tour started in the entrance hall with its fabulous carved wooden walls and ceiling. The majestic moose heads did not dominate but enhanced the space. The guide, despite being rather oddly dressed in tails, cravat, stout modern shoes, a machine-hemmed breast pocket handkerchief and modern lapel buttons (one featuring a silver fern?) was nevertheless very knowledgeable and entertaining. First we were shown an incompletely renovated room with some glorious old wallpaper, an exposed wall ands various other bits and pieces related to the earthquake and subsequent restoration. A quick inspection of the library followed. This is part of the oldest part of the house, built by Dave’s GGGrandfather James Johnstone. Then on to the kitchen with its beautiful William Morris wallpaper, a modern version close to that of the original. A quick tour of the dining room, scullery and pantry …. …. then up the magnificent stairway with its huge acorn-topped newel posts; a figure entirely carved from one piece of wood stood guard at the top. Carving around lintels; and an old heater. Various bedrooms followed, each with its own distinctive wallpaper, matched where possible to fragments of the old. The ceiling fixtures were newly gilded. A commodious commode! Flap up, then circular lid removed …. Much more aesthetic and easier to use one would imagine than a bedpan kept under the bed. Part of the main bedroom. Not shown is a trapdoor giving access to the cellar, in case of fire. Up narrow stairs to the attic, which was used mainly as a children’s playroom. The Deans were enlightened employers who did not expect their employees to live in cramped attic accommodation but provided good-sized rooms – as shown by the Nanny’s room (shown later). Here’s an array of old posters with luggage underneath. A surprise find for Dave and me was a trunk used on the “Merope” which brought the first Gibb family to NZ – did John Gibb know the owner of the trunk, Walter Heavem? Back down the stairs to more beautiful bedrooms and a bathroom and toilets (not shown). Almost all wardrobes were built-in. Some bedrooms have been turned into offices, there were originally 13. In a wardrobe: a christening gown worn by generations of Deans and their descendants and relatives. Lace, ornate pots, gloves …..
Part of the nursery, complete with potties…. and in a nearby linen cupboard, a package of early disposable nappies. The Nanny’s room, with narrow iron bed, sewing machine and views over the garden. Back downstairs to the tea room with its particularly ornate ceiling rose. One member of the Founders recalled having tea there when he was eight! Another had his wedding reception in this room. Here we had restorative cups of coffee and cake. Outside for an inspection of Deans Cottage, the oldest building on the Canterbury Plains. Built for pioneering Scottish brothers William and John Deans in 1843. “Built from timber cut in Riccarton Bush and pit sawn into boards, the cottage was the first home shared by the Deans as they strove to establish their farming vision at Riccarton. The brothers lived in the cottage until their early and tragic deaths. William drowned in the shipwreck of the barque “Maria” when she struck a rock near Cape Terawhiti off the Wellington Heads in July 1851. John, who travelled to Scotland in 1852 to marry Jane McIlraith, returned to Riccarton in February 1853 and died in the cottage from tuberculosis in June 1854. Dave’s GGGrandfather James Johnstone (1807-1870) is believed to have been one of the builders. Then a quick tour of Deans Bush with its majestic Kahikatea trees. The Bush is a remnant of the vegetation of the early Canterbury Plains. It is enclosed in a predator-proof fence. Recently we received a surprise email from an Auckland friend – could she come and stay with us in Christchurch and hitch a ride to Kaikoura to inspect and probably buy a tiny little vintage Austin tourer circa 1927? But of course! And so it was arranged. We were keen to see Kaikoura where there was a major earthquake last year; the coast road was blocked by landslips etc exacerbated by wild weather for almost a year and is still being repaired so it was interesting to see how it was going. That stretch of coast is a favoured seal habitat and also Kaikoura is a well-known whale watch centre; very fortunately the sea life has all returned even though the sea level is now about a metre lower than it was before and the seabed near the coast has some new topography. (Some photos taken on the return trip). Jacqui had recently posted a number of photos of the Napier Art Deco weekend festivities on Facebook, posing in gorgeous vintage dresses against various beautiful old cars. I took the opportunity to offer her some 20s and 30s dresses and accessories which once belonged to my Aunt Betty (why had I kept them for so long?) and peacock feathers collected at a homesit last year, while Dave contributed his mother’s crocodile skin handbag and some jewellery and long white gloves. We both produced beautiful old silky stoles with metallic embroidery and long fringes – not worn nowadays but perfect for Vintage occasions. To transport all this new finery Dave added an old leather suitcase and me a small tin trunk. Everyone was very happy – I felt sure my Aunt would be too, knowing her carefully hoarded ‘best’ was being put to good use again. We set off for Kaikoura one rainy morning (after first feeding the cats and giving Oscar his twice-daily insulin injection – so we had to be back in time for the evening one). The weather wasn’t too bad but did not improve as we approached Kaikoura despite a hint of blue skies. Recent wild weather had caused numerous slips on the top of the range as well as the coastal highway so it was occasionally slow going. We had time for a warming cup of coffee at our favourite Kaikoura cafe and for Jacqui’s Knight in Shining Armour (as will be seen) to turn up, having arrived on his motorbike by a devious route after leaving his ute and trailer at Wellington. Crossing the Straits with just the bike he was not content to ride to Kaikoura by the newly-opened coast road but elected to ride mostly in the rain (hence he arrived shiny despite a thick layer of mud!) via the Molesworth Track to Hanmer then North-East to join the main highway not far behind us. Not that we knew! After coffee it was just a short walk in the rain (!) to inspect the Austin “Chummy”. An enchanting little red car with a fabric hood. Jacqui immediately took it for a short run – after a push-start as the battery was flat – without the side windows of course, no rear view mirror, and a split windscreen. Then back into the shed and, transaction concluded, the side windows were fitted (sort of) and the little car loaded up. Our old leather trunk slid into the space behind the driver perfectly. Jacqui had brought an assortment of useful tools including special rare Austin spanners, which all fitted into the small tin trunk. A quick lunch then it was out onto the road – and another less successful push-start down the road and a section of the footpath to the nearest garage. Petrol was poured straight into the engine, or so it appeared (the tank inlet is under the bonnet), tyre pressures were checked and adjusted, then with some more huffing and puffing and pushing from various helpful males finally the engine fired and Jacqui was off! Pete followed behind on his bike, to pick up the pieces (surely not). We followed too for a short way, then turned back for the run back to home, a diabetic cat, another cat and a foxie dog who had managed not to wreck the place in our absence, apart from a little pile of tissues (her specialty – always in a pile, not scattered) and some mysterious doggy footprints on the forbidden bed. Meanwhile “Chummy” had decided to misbehave. First the hood literally blew off or rather backwards; Pete following on his bike helped secure hood and windows down with tape. Then at the 60 km mark, or was it 90 km, the engine decided it had had enough. In fairness it was the first real run it had had in a very long time. A helpful policeman stopped and enlightened them where they were and was most cooperative. Then the AA arrived with a trailer, they got to Picton and not only got a berth on the late ferry but a tow into the bowels of the ferry. The ferry staff enjoyed helping offload such a cute little vehicle at Wellington, where Pete AKA the KISA speedily went off to collect his ute and trailer and arrange with a friend for a bed. Next day we were told they managed the long haul all the way to Auckland. We hope to see “Chummy” again one day, back in the south island in a Vintage car rally or two. I’ve been cleaning up a huge selection of old emails dating back to 2002, preparatory to deleting everything from my old computer. Other photos will have to wait till I can dig them out from storage. When I left Brisbane in 2000 I gave my aged little Burmese cat Babouche, too old and arthritic to bring to chilly NZ, to a friend who already had another cat affectionately named Fleabag. After a cat-less year in NZ Dave and I adopted Saba, a youngish female Burmese of unknown history. Dave already had a little Miniature Pinscher named Tahi. Now read on …. Great to hear from you and quite surprised to learn that Fleabag and Babouche are now friends. It would be good if we could induce the same happy state between Saba and the deaf white cat next door. Unfortunately at their first encounter, they had a staring match then White strolled awayand Saba the friendly extrovert took this as an invitation to play chasings… bounded after, surprised White who naturally attacked…. sigh…. Saba now spends much time following White’s outdoor explorations of OUR garden via various windows, growling now and then ….. This weekend Dave and a friend attempted the mammoth task of clearing out the garage, full of FIVE motorcycles or at least bits of them, plus god knows what else … Saba had an absolute ball, flirting with the men, playing with the dog occasionally, and continually inspecting all the wondrous things brought outside specially for her inspection. Never seen her occupied so continuously for so long! She must have been a motorcyclist in a previous life. When we got back from our 10 days down south, and went to collect Saba from the cattery – right beside her in the next cage (in the cattery section mind you) was a familiar little dog – Tahi! Apparently Dave’s sister who was looking after Tahi had to take him there for the last 2 days and Saba went wild when she saw him, raced up and down her cage, and they were allowed to play together too …. the cattery/kennels is run by a very nice understanding person (!). people get stuck and towed out continuously, and of course ‘cos I had total faith in Dave, I wasn’t particularly concerned. We stayed together with the other truck for the rest of the day, got back to the town at dusk, went to the pub for the best ever meal of lamb shanks, then fell into our tent and slept for 12 hrs! Tried out my brand new trout rod but no luck. We’d hoped to do some serious fishing towards the end, but the weather didn’t cooperate. It’s hard to believe the change two days makes. The kitten Aza now comes dancing out from her hiding places, tail sticking straight up, when we enter her room, and makes straight for our laps. She’s less inclined to play and more inclined to snuggle up, which means I spend much less time at my computer – a good thing?? … She’s showing increasing interest in the big wide world outside the door and it won’t be long before she makes a bolt for it. I intend to introduce her formally to our other cat Saba tonight. Saba has seen Aza and growled a bit but not threateningly. The dog doesn’t seem worried so long as he knows where Dave is. well. Aza is being surprisingly submissive and I keep on wondering if it is all a ploy! Aza is actually only the second kitten I’ve had – Babouche was the first – I’ve always had cats but usually they adopt me or come to me half grown. We have lost our Saba, the seal Burmese. She was out ‘visiting’ and was attacked by a dog, rescued by a young neighbour, but died on the way to the Vet “from shock”. The neighbours buried her for us at the foot of our garden, with a wooden cross decorated with her collar and name tag and bell, their names all over the cross (9 children aged 2-13), 3 adults) and flowers at the foot. I think they are Maori. All this while we were out of contact for 4 days, trying to catch fish over on the West coast. It seems this family were Saba’s second family, she visited them often and occasionally spent the night in one of their beds, but always refused food and returned home for it. She probably had a couple of other families around too. Aza the blue Burmese-X is less inclined to wander thank goodness. what’s more they could not have picked a better place to bury her, near her favourite apple tree from whose branches she launched herself into her secret world!! It seems that the neighbours on our other side also helped – the burial was their suggestion as nobody knew when we would be back, and our cat-feeder Lesley didn’t catch up with events until the next day. To replace Saba we went back to Aza’s breeder and were chosen by Rex, who sat quietly in the middle of a room swarming with kittens, and gave me the eye. I have some sad news, our Aza the blue Burmese-X (Arzani Shaku Blue, from Arzani Black Lucifer and Rothrose Shaku according to the pedigree you gave us) has just been put down. Two mornings ago a neighbour came round and said she was in her garden, looked like she had been hit by a car. However after 5 X-rays ($$$!) the Vet still couldn’t find any real evidence, and nothing to indicate a dog attack either. We are now 99.9% sure she had a spinal tumour which I understand is fairly common in young cats; there were actually some indications about 6 months ago that all was not 100% but as she seemed to recover we ignored them. With paralysed hindquarters and very poor prognosis I had her put down while I literally held her paw. She’s now been buried under the apple tree next to her mate Saba the Seal Burmese we got from the Cat Protection Society. Rex, the seal Burmese (Arzani Shaku’s Deter) is however going full guns – really adorable. He’s the most laid-back cat I’ve ever known!! 21 Feb. More drama, Rex did not come in late last night and hasn’t been seen since. I expect he has been accidentally locked up in a garden shed etc where he was looking for Aza. At least I hope so. I’m trying not to panic (crooked grin). He has been prowling around looking for her everywhere. But it turned out Rex had ventured out onto the road where he never normally went, looking for his mate, and was hit by a car. A neighbour heard something, saw a car stop, the people examined something on the road then put it in a sack and took it to a rubbish bin opposite. Rex was wearing a collar with a tag bearing his address and our phone number, but we never received a call. Last weekend was really busy with the Classic Motorcycle racing at Levels Raceway over a 3-day weekend and the Canterbury branch of the New Zealand Founders Association Christmas dinner on the Saturday evening. With the Liberals Raceway being 160 km south of Christchurch and the founders dinner 70 km north of Christchurch it involved a bit of driving. Also I had to be home to talk to the fibre guys about installing fibre into Roydon Drive on Friday morning. Nancy and I returned from our Invercargill trip on Thursday, cleaned up and restocked T5. After the fibre guy had left on Friday morning I left Nancy at home with Penny and headed for Timaru. I went to the caravan park at Seadown where Nancy and I had stayed before and dropped off T5, then to Levels Raceway to meet up with old friends and check out all the bikes. After checking out all the old bikes I found a good spot to take photos and spent a couple of hours getting back into practice at shooting motorcycles. Then when wandering through the pits I found a friend having trouble with the clutch and spend some time offering advice and then getting my fingers dirty. After a couple of beers and some greasies I headed back to T5 for the night. Shaun Mills. The clutch seems to be working OK now. Dennis Charlett, the man to beat. Pete Dowman and Brian Greenlees ahead of Jarrad and Keli Winter. After checking out some more of the machinery I spent some time taking photos until midday when I had to pack up and drive back to Ch’ch. After a shower and a quick change Nancy and I picked up big Sister Alison and headed for a property at the back of Loburn. John Blaymires and Charles Bilby. John Blaymires and Charles Bilby again, showing the MotoGuzzi motor. We arrived about 4 pm and found some people already sitting under the shade of some magnificent old trees where the nibbles were plentiful and the talk was flowing … The potluck dinner was excellent and the company was good and a great time was had by all I think. We left Loburn in brilliant moonlight from the nearly full moon. Next morning I was away from Templeton early …. again …. and heading back to Levels where I arrived in time to check out some more lovely old bikes and also a few not so old bikes before the racing started …. then spent most of the rest of the day taking photos. After helping Rob pack up (which mainly consisted of holding my beer and trying to keep out of the way) we headed down to the prize-giving at the track bar. Kevin ? and Michael Dowman. Campbell Stevenson leading inside Jeff Cameron. Luckily Seadown was not too far away from the track so I was back at T5 in time to get all hooked up and move a bit forward to get some TV reception so I could watch “Blue Planet” before hitting the sack. Monday morning I was on the road extremely early, so early that I was too early to see the Aviation Museum at Ashburton, so I that flagged that and headed straight home. (To a rapturous welcome from wife, dog and cats, I might add – Nancy). I have fallen behind again with this blog – we’ve been back home over a week. Leaving Clyde we set off for Tekapo, with a quick stop at Cromwell to buy some berries. At first there were only Southland yellow lupins lining the road, but then colours started to appear. By the time we were in the southern foothills of the Lindis Pass there were swathes of brilliant colour everywhere, sometimes well inland along the waterways. It is fortunate that lupins are not poisonous to stock and in fact can be used as feed for sheep at least. Thanks to recent rain the normally brown hillsides of the Lindis seemed to be clothed in green velvet, rather ancient velvet perhaps, discoloured in places and occasionally moth-eaten. Then downhill again and more lupins. At Twizel we stopped for lunch and to visit the Ulysses tree. It was planted a few years back to mark 25 years since the first AGM was held in Twizel. Any members going past give it a good watering. On past Lake Pukaki with its views of Mt. Cook. And so to Tekapo. The town continues to enlarge; there is now a new supermarket. It always seems strange to be there without our boat (sold when we started caravanning). Those chilly days when we trolled slowly for salmon and trout, rugged to the eyebrows, gazing at the snow-covered hills as we circumnavigated little Motuariki Island – they seem so long ago. But it’s always good to be back. 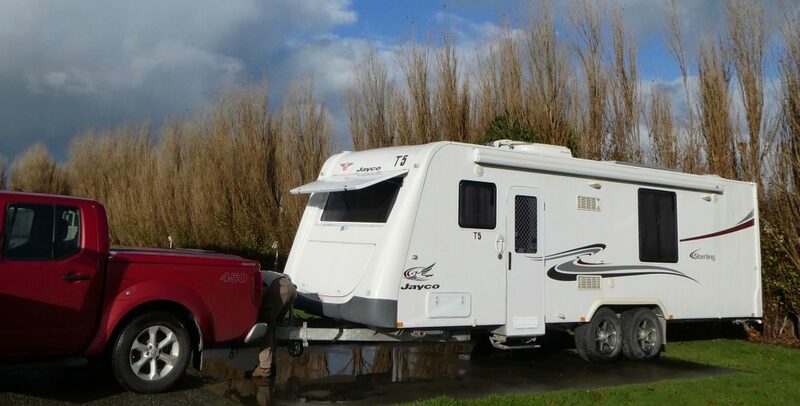 The NZMCA (Motorhome & Caravan Owners’ Assoc.) has a good camp on the foreshore, among the pine trees. It took us time to find a reasonably open patch of ground open to the north so we could receive TV reception. A later arrival tried several positions before he found one to suit. The only drawback of that camp was the heavy load of pollen which drifted down from the trees; it covered the truck and got in my hair! An evening walk yielded some photos a little different to the usual lupin-laden ones! There were lots of rabbits to be seen, including this black one which is surely an escapee..
That evening there was a phone call from Graeme and Barb in Clyde – their TV was on the blink again. They’d been so thrilled when Dave got it working for the first time in weeks. We decided to go back to Clyde for a day, leaving the caravan at Tekapo. Another reason was that Penny had left her favourite ball behind at the camp site beside the Dam (!). We did not stop to take lupin photos on the way but I did manage to get a few through the windscreen. There was a cattle muster going on and at one stage we rounded a bend just as a helicopter landed beside the road. No time to take a photo – so I was amazed when I discovered the helicopter, presumably the same one, in one of my slightly earlier photos. Some cattle are visible too. On arrival we went to the Dam first and there was Penny’s ball lying in short grass in full view of anyone walking their dogs – amazing it wasn’t snapped up particularly as it glows in the dark! Definitely a good omen. G and B gave us a lovely lunch, the TV was fixed again and at last report was behaving, and it was back to Tekapo with coffee at Twizel on the way and more photos of Mt. Cook, which must have been busy making more clouds. I have been experimenting with some photo-enhancing software so these photos have different textures. NOT a wasted day, the scenery alone on the drive is always fantastic. This time I remembered to take a photo of the poplar trees beside the river between Clyde and Cromwell. Compare with an earlier photo taken in 2013 at a very different time of year. There were some interesting clouds and then just past Lake Pukaki we encountered a terrific rainstorm, it came up very fast and the rain was so heavy it was almost impossible to see the road. Luckily it did not last long. Next day – home! We arrived around lunchtime to a transformed garden (amazing how plants respond to warmth and water) and a lovely welcome from the cats. Even Penny seemed happy to be back home.